Labour is undergoing a “rebirth” in its former Scottish heartlands, Jeremy Corbyn claimed yesterday. Following the party’s wipe-out in the 2015 general election, when it lost all but one of its Scottish seats, Corbyn insisted it was once again a “force for change”. Addressing the Unite union’s Scottish policy conference in Aviemore, the Labour leader said that after gaining six seats at the last election in June they were now “in the running for many more”. “Labour is once again a force for change in Scotland,” he said. “We have been written off time and again, but we showed that it is our party that is capturing the mood both in Scotland and across the UK. “We are under no illusions. “There are still many people who need to be persuaded to put their trust in the Labour Party once again. Corbyn highlighted the government’s recent climbdown over charges of up to 55p a minute to call as Universal Credit helpline as an example of the difference the party was making. “This is a victory for Labour. “But it shows why a Labour government is needed to fully reform the whole benefits system,” he said. On Brexit, he said that while the party accepted the result of the referendum, it was seeking a “jobs first” deal which prioritised jobs and preserved employment, social and environmental rights and protections. 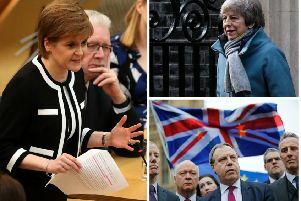 “We want a deal that works for Scotland and all parts of the UK and respects the devolution settlement by ensuring that powers returning from Brussels go directly to Edinburgh, Cardiff or Belfast rather than being hoarded in Westminster,” he said. Meanwhile, Scotland’s economy secretary Keith Brown told the Unite conference yesterday that Scotland’s economy was “fundamentally strong” and ready to meet the challenges of Brexit. Brown said that the economy was growing while the number of people in employment had risen and unemployment had fallen. However, he said withdrawal from the EU posed some “serious headwinds” and warned that a no-deal Brexit would be “catastrophic”. He said Scotland would lose an estimated £11 billion a year by 2030 in that scenario, while there would be 80,000 fewer jobs. Ensuring fair working conditions and defending employee rights were further challenges, the Economy Secretary said. He told the conference: “Scotland’s economy continues to face some serious headwinds from Brexit and rising inflation and that’s very much tied into the Brexit decision. “We also still have issues around insecurity and zero-hours contracts. “While employment figures are very good we have to dig down into underemployment and exploitation. Brown reiterated the Scottish Government’s position that Scotland’s interests would be best served by remaining in the EU and certainly within the single market. He also said trade unions and Scottish ministers should work together to press the UK government to devolve employment law to Scotland.